Israeli forces continued with systematic crimes, in the occupied Palestinian territory (oPt), for the week of 17 – 23 January, 2019. Israeli forces killed a Palestinian civilian and wounded 7 others, including 3 children and a journalist, in the West Bank. Israeli forces continued to use excessive force against peaceful protestors in the Gaza Strip. 125 civilians, including 41 children, 6 women, 4 journalists, and 6 paramedics, were wounded; the injury of one of them was reported as serious. In the Gaza Strip, the Israeli forces continued to use lethal force against the participants in the peaceful protests organized along the Gaza Strip borders, which witnessed the peaceful protests for the 43rd week along the eastern and northern border area of the Gaza Strip. They also continued to use armed force as well during the incursions into the West Bank. In the West Bank, the Israeli forces killed a Palestinian civilian and wounded 7 others, including 3 children and a journalist. In the Gaza Strip, the Israeli forces wounded 125 civilians, including 41 children, 6 women, 4 journalists, and 6 paramedics. The injury of one of those wounded was reported serious. In the West Bank, on 21 January 2019, in a new crime of excessive use of lethal force, Israeli forces stationed at Howara military checkpoint, at the southern entrance of Nablus, killed a Palestinian civilian after opening fire at him. According to PCHR’s investigations, at approximately 20:40, the Israeli forces stationed at Howara military checkpoint, at the southern entrance of Nablus, opened fire at a Palestinian civilian, causing critical wounds to him, and left him bleeding until his death. Moreover, the Israeli forces claimed that he attempted to carry out a stabbing attack while he was crossing the checkpoint by his car returning from Nablus. According to the Israeli forces’ claims, the Palestinian civilian stepped out of his car and tried to stab an Israeli soldier, but the soldier’s bulletproof vest protected him from being wounded while he was at the checkpoint where the Israeli soldiers check drivers’ ID cards. It should be noted that the civilian was left bleeding at the checkpoint around an hour after his injury as the Israeli forces prevented the staffs of the Palestine Red Crescent Society (PRCS) from providing aid to him until he took his last breath. Later, the civilian killed was identified as Mohammed Fawzy Youssof ‘Adawy (36) from Balalta Rfugee Camp, was living in Rojeeb village, east of Nablus. Mohammed held ‘Azoun ‘Etma village’s ID card. According to the available information of the crime, the Israeli forces could use other ways to stop and arrest him and they could allow the PRCS staffs to provide aid to the civilian if their intention was not to kill him. In the same context, during the reporting period, the Israeli forces wounded 7 Palestinian civilians, including 3 children and a journalist, in different shooting incidents. 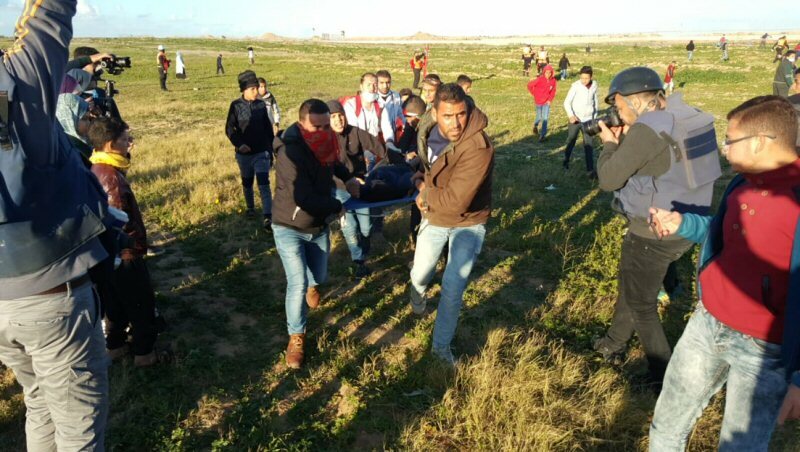 As part of using excessive force against the peaceful protesters along the Gaza Strip borders, during the reporting period, Israeli forces wounded 125 Palestinian civilians, including 41 children 6 women, 4 journalists, and 6 paramedics. The injury of one of them was reported serious. As part of targeting the Palestinian fishermen in the sea, the Israeli forces continued to escalate their attacks against the Palestinian fishermen, indicating the on-going Israeli policy to target their livelihoods. During the reporting period, PCHR documented 10 incidents adjacent to al-Waha Shore, northwest of Beit Lahia, north of the Gaza Strip; 6 incidents adjacent to al-Sodaniyia Shore, west of Jabalia, north of the Gaza Strip; one incident in the Gaza City Sea; and one incident in Khan Yunis Sea. These incidents resulted in the arrest of a fisherman and confiscation of his boat. As part of targeting the border areas, on 22 January 2019, an Israeli tank stationed along the border fence with Israel, northeast of Beit Hanoun, north of the Gaza Strip, fired a shell at a checkpoint belonging to the Palestinian armed groups and no casualties were reported. As part of the airstrikes, on 22 January 2019, Israeli helicopters and warplanes fired 5 missiles at ‘Asqalan military site belonging to al-Qassam Brigades (the armed wing of Hamas Movement) in al-Sifa area, northwest of Beit Lahia, north of the Gaza Strip. The site sustained material damages, but no causalities were reported. As part of the collective punishment policy adopted by the Israeli forces against the families of Palestinians accused of carrying out attacks against Israeli soldiers or/and settlers, on Friday early morning, 18 January 2019, the Israeli forces blew up a building belonging to the family of prisoner Khalil Yousef Jabreen (17) in Yatta, south of Hebron. According to PCHR’s investigations and eyewitnesses, at approximately 01:00 on the abovementioned day, Israeli forces backed by military vehicles, armed personnel carriers and a military bulldozer moved into Yatta, south of Hebron, and stationed in al-Hilah area in the center of the city. They then stepped out of their military vehicles, deployed between houses and topped their roofs. The soldiers closed all entrances leading to the house of Khalil Jabareen. A large number of the Israeli soldiers raided the abovementioned house to apply the blowing up decision which the family was informed of previously under the pretext of carrying out a stabbing attack by Khalil, on 16 September 2018, in “Rami Lifli” shop in the vicinity of “Gush Etzion “ settlement, south of Bethlehem. This attack resulted in the killing of an Israeli settler and the injury of another one, while Khalil was hit with several live bullets and later arrested. During the reporting period, Israeli forces conducted at least 69 military incursions into Palestinian communities in the West Bank and 6 similar incursions into Jerusalem and its suburbs. During those incursions, Israeli forces arrested at least 39 Palestinians, including 5 children and a woman, in the West Bank. Moreover, 9 others, including 2 children, were arrested in Jerusalem and its suburbs. In the Gaza Strip, on 18 January 2019, Israeli forces moved 100 meters into al-Shawkah village, east of Rafah, south of the Gaza Strip. On 21 January 2019, they also moved 100 meters into the southern side of the border fence with Israel, northwest of Beit Lahia, north of the Gaza Strip. They levelled and combed lands that were previously levelled. As part of the Israeli house demolitions and notices, on 21 January 2019, Haitham Mohamed Mostafa self-demolished his commercial facility in al-‘Issawiyia village, northeast of occupied East Jerusalem, under the pretext of non-licensing. Mohamed Abu al-Humus, Member of al-‘Issawiyia Follow-up Committee, said that the facility is a garage for repairing vehicles, which is located in the eastern area of the village. He added that the Nature Authority and the Israeli Municipality issued a decision to demolish the facility and the Israeli police came to Haitham’s facility ordering him to demolish it or the Israeli Municipality vehicles will implement the demolition. In this case, Haitham will force to pay the demolition costs estimated at NIS 80.000. It should be noted that Haitham built the garage a month ago, which was a concrete floor with iron columns and sheds. As part of impose restrictions on Palestinian institutions’ work in occupied Jerusalem, on 20 January 2019, during an official meeting with the Israeli Municipality in occupied East Jerusalem, the administration of al-Sakakini and al-Quds Preparatory Schools, which are located in al-Sahira Gate area, were inoformed that students will not be able to enroll for the new school year of 2019 – 2020. Ziad al-Shamaliy, Head of Parents’ Association in Jerusalem, said that the Israeli Municipality has been seeking since 3 years to open a school outside of the Old City and transfer all the students there and close all the Arabs schools in the Old City. It should be noted that Israeli Municipality meeting with the schools’ administration did not give reasons for closing the schools. On 21 January 2019, Israeli forces accompanied with Israeli Intelligence and Police officers raided al-Makassed College Hospital while holding a celebration for the hospital titled “50 Years of Excellence and Development on Jerusalem Soil”. The Israeli forces stopped the activity and ordered all attendees to leave. Dr. Bassam Abu Libdeh, Director of al-Makassed Islamic Charitable Society Hospital, said that the Israeli Intelligence officers handed him a notice signed by the Minister of Internal Security to prevent the activity under the pretext of being organized by the Palestinian Authority. As part of settlement crimes and demolitions, on 21 January 2019, the Israeli forces levelled 4 dunums and stones chains, in addition to uprooting 35 olive seedlings and 38 almond seedlings in Betir village, west of Bethlehem. These lands belong to Sa’ied Mohamed Abu Harithiyia. As part of the Israeli settlers’ attacks against the Palestinians civilians and their property, on 18 January 2019, a group of Israeli settlers from “‘Ady‘Aad ” settlement, cut and damaged around 23 olive trees in al-Naqar neighborhood, which belongs to al-Moghir village, northeast of Ramallah.The trees planted 5 years ago and belong to Jamal Abdullah Na’ssan and maher Rezeq Na’ssan. On 20 January 2019, a group of Israeli settlers from “Ma’oun” settlement established on the confiscated Palestinian civilians’ lands in al-Twana village, east of Yatta, south of Hebron, damaged 2 olive trees planted 15 years ago. The damaged trees belong to Hafeth Hussain Hareeny (44) from al-Twana village. On 22 January 2019, a group of Israeli settlers from “Beit ‘Ain” settlement established on Palestinian civilians’ lands, west of Beit Ummer village, north of Hebron, cut 30 olive trees planted many years ago in Khelet Abu al-Rish area in Kherbet Safa, northwest of the village. The trees belong to Ibrahim Thalji Slibiy (80), from Beit Ummer village. 1- Ahmed Nabil Ghanem (31), who works at al-Mayadeen TV channel, was directly hit with a tear gas canister to the right foot. 2- Mohammed Jawad Saqer (28), who works at Agence-France-Presse (AFP), was hit with a tear gas canister to the left foot. 3- Mahmoud Abu Qadous, who works as a photojournalist at Siraj Network, was hit with a tear gas canister to the right foot. Northern Gaza Strip: The Israeli shooting at Palestinian demonstrates resulted in the injury of 17 civilians, including 8 children and 2 female paramedics. 3 of them were hit with live bullets and shrapnel and 14 were directly hit with tear gas canisters. The injury of one of them was classified as critical. The wounded female paramedics were identified as Amal Omar Khamees Jaber (21), a volunteer paramedic at the Ministry of Health, who was hit with a tear gas canister to the left thigh; and Jameela Sobhi Youssof al-Feery (19), a freelance paramedic, who was hit with a tear gas canister to the right shoulder. Central Gaza Strip: The Israeli shooting and firing tear gas canisters, which continued until 17:00, resulted in the injury of 22 civilians, including 11 children, a woman, and a paramedic. One of them was hit with a live bullet and 21 were directly hit with tear gas canisters. The wounded paramedic identified as Rezeq Anwar Rezeq Abu mandil (28), who works at the Palestinian Medical Relief Society, from al-Maghazi camp, was directly hit with a tear gas canister to the lower limbs. Moreover, an ambulance belonging to the Palestine Red Crescent Society (PRCS) sustained material damages due to hitting with a tear gas canister. 1- Ossama ‘Aboud Baraka (34), from Khan Younis and works as a volunteer paramedic at the Ministry of Health, was hit with a tear gas canister to the left leg. 2- Nayfa Hussain Abu Jame’ (22), who is a member of Rowad al-Salam team, was hit with a tear gas canister to the head. 3- Mohammed Nasser Kamel Abu Daqa (20), who is a member of Rowad al-Salam team, was hit with a tear gas canister to the chest. Rafah: The Israeli shooting at the demonstrators, which continued until 17:00, resulted in the injury of 12 civilians, including 6 children. 4 of them sustained live bullet shrapnel wounds and 8 were directly hit with tear gas canisters. At approximately 16:50 on Saturday, 13 January 2019, Israeli forces stationed along the border fence with Israel, east of al-Buraij camp in the central Gaza Strip, opened fire at demonstrators, who were 100-150 meters to the west of the border fence near the Return Camp, east of al-Buraij camp. As a result, an 18-year-old child was hit with a live bullet to the lower limbs. At approximately 16:15 on Sunday, 20 January 2019, Israeli forces stationed along the border fence with Israel, east of al-Buraij camp in the central Gaza Strip, opened fire at demonstrators, who were 100-200 meters to the west of the border fence near the Return Camp, east of al-Buraij camp. As a result a child, from Gaza City, was hit with a live bullet to the lower limbs. At approximately 13:30 on Friday, 18 January 2019, a peaceful demonstration started from the center of Kafur Qaddoum village, northeast of Qalqiliyia, and then headed towards the eastern entrance to the village, which was closed 15 years ago in favor of “Kedumim” settlement. The demonstrators chanted national slogans calling for ending occupation and condemning the Israeli forces‘ crimes committed against Palestinian civilians in the Gaza Strip. The demonstrators threw stones at the Israeli soldiers stationed behind sand berms. The Israeli soldiers fired sound bombs, rubber bullets and tear gas canisters at them. As a result, 3 civilians were wounded. Among those wounded was J’afar Zahed Ishtaya (46), a photojournalist at Agence-France-Presse (AFP), who was hit with a rubber bullet to the right leg. Moreover, Israeli forces raided a house belonging to Tariq Hekmat Ishtewy (14) and then arrested him under the pretext of throwing stones. As part of the collective punishment policy adopted by the Israeli forces against the families of Palestinians accused of carrying out attacks against Israeli soldiers or/and settlers, on Friday early morning, 18 January 2019, the Israeli forces blew up a building belonging to the family of prisoner Khalil Yousef Jabreen (17) in Yatta, south of Hebron. According to PCHR’s investigations and eyewitnesses, at approximately 01:00 on the abovementioned day, Israeli forces backed by military vehicles, armed personnel carriers and a military bulldozer moved into Yatta, south of Hebron, and stationed in al-Hilah area in the center of the city. They then stepped out of their military vehicles, deployed between houses and topped their roofs. The soldiers closed all entrances leading to the house of Khalil Jabareen. A large number of the Israeli soldiers raided the abovementioned house to apply the blowing up decision which the family was informed of previously under the pretext of carrying out a stabbing attack by Khalil, on 16 September 2018, in “Rami Lifli” shop in the vicinity of “Gush Etzion “ settlement, south of Bethlehem. This attack resulted in the killing of an Israeli settler and the injury of another one, while Khalil was hit with several live bullets and later arrested. The Israeli soldiers forced the family to evacuate their 3-story house, which includes 4 apartments, and forcibly deported them. Following that, a large number of Israeli soldiers raided and searched the residential houses in the vicinity of the above-mentioned house. They forced the residents to evacuate them immediately and forcibly, causing fear among them. The residents were forced to leave 200 meters away, where they were detained in nearby houses for 5 consecutive hours. They were more than 70 civilians, including children, women and elderlies, detained in a very cold place. In the meantime, dozens of young men and boys gathered, set fire to tires and threw stones and empty bottles at Israeli soldiers who deployed in al-Hilah area and heavily fired tear gas canisters at them. As a result, many civilians and journalists suffered tear gas inhalation and fainting. Meanwhile, an Israeli military force was demolishing the internal walls of the 3rd floor of the house with special equipment and planting a large quantity of explosives inside it in preparation for blowing it up. At approximately 06:30, the 3rd floor built on an area of 140 square meters was blown up and completely destroyed, which the 1st and 2nd floors sustained cracks. Israel continued to impose a tight closure on the oPt, imposing severe restrictions on the movement of Palestinian civilians in the Gaza Strip and the West Bank, including occupied East Jerusalem. Israeli forces continuously tighten the closure of the Gaza Strip and close all commercial crossings, making the Karm Abu Salem crossing the sole commercial crossing of the Gaza Strip, although it is not suitable for commercial purposes in terms of its operational capacity and distance from markets. Israeli forces have continued to apply the policy, which is aimed to tighten the closure on all commercial crossings, by imposing total control over the flow of imports and exports. Israeli forces have continued to impose a total ban on the delivery of raw materials to the Gaza Strip, except for very limited items and quantities. The limited quantities of raw materials allowed into Gaza do not meet the minimal needs of the civilian population of the Gaza Strip. Israeli forces also continued to impose an almost total ban on the Gaza Strip exports, including agricultural and industrial products, except for light-weighted products such as flowers, strawberries, and spices. However, they lately allowed the exportation of some vegetables such as cucumber and tomatoes, furniture and fish. Israel has continued to close the Beit Hanoun (Erez) crossing for the majority of Palestinian citizens from the Gaza Strip. Israel only allows the movement of a limited number of groups, with many hours of waiting in the majority of cases. Israel has continued to adopt a policy aimed at reducing the number of Palestinian patients allowed to move via the Beit Hanoun crossing to receive medical treatment in hospitals in Israel or in the West Bank and East Jerusalem. Israel also continued applying the policy of making certain civilian traveling via the crossing interviewed by the Israeli intelligence service to be questioned, blackmailed or arrested. At approximately 21:15 on Saturday, 19 January 2019, Israeli forces established a checkpoint near the entrance to Burqeen village, west of Salfit. They then arrested Mohamed Jamal Shu’aib, from Kafur ‘Ain village, northwest of Ramallah. On Tuesday, 22 January 2019, Israeli forces stationed at a military checkpoint established in the vicinity of al-Ibrahimi Mosque in Hebron, arrested Khalil Mohamed Ahmed al-Berawi (15), from Yatta, south of Hebron, claiming that he had a knife. At approximately 01:00 on Saturday, 19 January 2019, Israeli forces moved into al-‘Ain neighborhood in Silwan village, south of occupied East Jerusalem’s Old City. They raided and searched a house belonging to Eyad ‘Alaa Ghaith (19) and then arrested him. At approximately 01:00 on Sunday, 20 January 2019, Israeli forces moved into Beit Doqqou village, northwest of occupied Jerusalem. They raided and searched a house belonging to Hussain ‘Adel Bader (18) and then arrested him. On Sunday morning, the Israeli Police Commander in occupied East Jerusalem issued decisions to deport 6 Jerusalemite civilians from al-Aqsa Mosque in the Old City. Feras al-Debs, Head of Media and Public Relation Department in the Islamic Endowments (Awqaf), said that the Israeli authorities deported 5 of al-Aqsa Mosque’s guards, who were identified as Loai Abu al-Sa’d and Ahmed Abu ‘Aliaa, who were deported for 6 months; Yehia Shehadah and Slman Abu Maiylah, who were deported for 4 months; and ‘Awad al-Salimah, member of Fatah Movement in Jerusalem, who was deported for 6 months. On Sunday, Israeli forces moved into Wadi Helwa neighborhood in Silwan village, south of occupied East Jerusalem’s Old City. They raided and searched houses, from which they arrested Thaier Masoudah, Nour ‘Asfour, Montaser Siyam, Yazan Siyam, and Mo’tasem Masoudah. On Monday, 21 January 2019, Israeli Intelligence officers raided al-‘Issawiyia School for boys in al-‘Issawiyia village, northeast of occupied East Jerusalem. Mohamed Abu al-Humus, Member of al-‘Issawiyia Follow-up Committee, said that the Israeli forces moved in the vicinity of al-‘Issawiyia School for boys while students were in a recess. The Israeli forces fired sound bombs at the school gate under the pretext of throwing empty bottles at the Israeli military vehicles. The students denied the soldiers’ claims. Mohamed Abu al-Humus added that the school administration was surprised with storming the school by the Israeli intelligence officers, who were wearing civilian clothes. No more incidents were reported. On Monday, Israeli forces moved into Ras al-‘Amoud neighborhood in Silwan village, south of occupied East Jerusalem’s Old City. They patrolled the area and then arrested Samer Jamjoum (16) and ‘Abdullah al-Zaghal (17) while walking on the neighborhood streets. The arrested civilians were then taken to Salah al-Deen Police Station for investigation. On Monday, 21 January 2019, Haitham Mohamed Mostafa self-demolished his commercial facility in al-‘Issawiyia village, northeast of occupied East Jerusalem, under the pretext of non-licensing. Mohamed Abu al-Humus, Member of al-‘Issawiyia Follow-up Committee, said that the facility is a garage for repairing vehicles, which is located in the eastern area of the village. He added that the Nature Authority and the Israeli Municipality issued a decision to demolish the facility and the Israeli police came to Haitham’s facility ordering him to demolish it or the Israeli Municipality vehicles will implement the demolition. In this case, Haitham will force to pay the demolition costs estimated at NIS 80.000. It should be noted that Haitham built the garage a month ago, which was a concrete floor with iron columns and sheds. On Monday, the Israeli court issued a decision, which forced Mohamed Omar Abu Hussain, from al-Mukaber Mount area, south of occupied East Jerusalem, to self-demolish his house or the court will impose a fine on him. The abovementioned 220-square-meter house was comprised of one floor and sheltering a family consist of 12 members, most of them were children. On Sunday morning, 20 January 2019, during an official meeting with the Israeli Municipality in occupied East Jerusalem, the administration of al-Sakakini and al-Quds Preparatory Schools, which are located in al-Sahira Gate area, were inoformed that students will not be able to enroll for the new school year of 2019 – 2020. The mother of student Sabreen Nader Jaber, said that her daughter is studying at al-Mailoula primary school in the Old City, and when she went to enroll her daughter to al-Sakakini Preparatory School, the school’s administration informed her that the school will be closed next year. Ziad al-Shamaliy, Head of Parents’ Association in Jerusalem, said that the Israeli Municipality has been seeking since 3 years to open a school outside of the Old City and transfer all the students there and close all the Arabs schools in the Old City. It should be noted that Israeli Municipality meeting with the schools’ administration did not give reasons for closing the schools. Al-Shamaliy clarified that the al-Sakakini and al-Quds Schools are for 7th and 9th He added that al- Sakakini School includes 300 students while al- Quds Schools includes 150 students. He also said that the abovementioned schools located few meters away from al-Aqsa Mosque and near an Israeli outpost and al-Laqlaq tower that is threatened of confiscation in favor of settlement projects. He said that the building of al- Sakakini School belonging to the Property Department of the Israeli Municipality while the building of al-Quds School belonging to al-Qara’een Family, which is rented by the municipality since occupying Jerusalem. On Monday morning, 21 January 2019, Israeli forces accompanied with Israeli Intelligence and Police officers raided al-Makassed College Hospital while holding a celebration for the hospital titled “50 Years of Excellence and Development on Jerusalem Soil”. The Israeli forces stopped the activity and ordered all attendees to leave. Dr. Bassam Abu Libdeh, Director of al-Makassed Islamic Charitable Society Hospital, said that the Israeli Intelligence officers handed him a notice signed by the Minister of Internal Security to prevent the activity under the pretext of being organized by the Palestinian Authority. He added that Israeli forces surrounded the college’s building and the Israeli Intelligence officers raided the stage, forced everyone to leave the hall, followed them to the college yard and forcibly got them out of the area. Wadi Hilweh Information Center said that the Israeli forces pushed the attendees and assaulted the hospital’s administration in addition to the Jerusalemites activists while they were in the college yard. The Israeli forces also arrested activist ‘Ahed al-Rashq and photojournalist Sa’eed al-Rokon and threatened the attendees with the stun gun. At approximately 09:00 on Friday, 18 January 2019, a group of Israeli settlers from “‘Ady‘Aad ” settlement, cut and damaged around 23 olive trees in al-Naqar neighborhood, which belongs to al-Moghir village, northeast of Ramallah. Moreover, Nash’at Na’ssan (37) said that, at approximately 08:30, he saw dozens of Israeli settlers approaching the barbed wire that surrounds the trees in al-Sedr area. They removed the barbed wire, entered the land, indiscriminately damaged olive trees and then left the place returning to “‘Ady ‘Aad ” The number of olive trees, which were damaged, were 23 planted 5 years ago. The trees belong to Jamal Abdullah Na’ssan and maher Rezeq Na’ssan. On Sunday morning, 20 January 2019, a group of Israeli settlers from “Ma’oun” settlement established on the confiscated Palestinian civilians’ lands in al-Twana village, east of Yatta, south of Hebron, damaged 2 olive trees planted 15 years ago. The damaged trees belong to Hafeth Hussain Hareeny (44) from al-Twana village. It should be noted that in 2018, the Israeli settlers attacked around 325 olive trees in Hebron, including 15 olive trees in al-Hamra area near al-Twana village. Al-Twana village is located 20 km to the southeast of Yatta, where around 250 persons are living. The village contains a health clinic attached to the village council’s building. It also contains a small mosque and a mixed primary school. Al-Twana village is considered one of the most prominent besieged villages and kherab that suffer from on-going harassments committed by the Israeli settlers. It is also besieged from its 4 sides by settlements and bypass roads. At approximately 14:00 on Sunday, a group of Israeli settlers, under the Israeli forces’ protection, moved into Solomon’s Ancient Pools, southeast of Bethlehem, and performed religious rituals. After that, the Israeli forces arrived at the area and completely closed it. They also prevented Palestinian civilians from being in the vicinity of Solomon’s Ancient Pools until the the Israeli forces and settlers withdrawal. On Tuesday, 22 January 2019, a group of Israeli settlers from “Beit ‘Ain” settlement established on Palestinian civilians’ lands, west of Beit Ummer village, north of Hebron, cut 30 olive trees planted many years ago in Khelet Abu al-Rish area in Kherbet Safa, northwest of the village. The trees belong to Ibrahim Thalji Slibiy (80), from Beit Ummer village.” Beit ‘Ain” settlement was established in 1992 by the by former Israeli Prime Minister Ariel Sharon. The settlement was built on the lands of al-Jab’a village, northwest of Hebron, and on the lands of Beit Ummer village. “Beit ‘Ain” settlement is one of dozens settlements that constitute “Gush Etzion” settlement bloc, one of the three major settlement blocs in the West Bank. “Beit ‘Ain” settlement is located 1.5 km to the north of Khebet Safa. By the end of 2007, there are around 906 settlers are living in the settlement. These settlers are classified as members of the most extreme right-wing parties in Israel, who do not accept Arabs in their living areas. PCHR warns of the escalating settlement construction in the West Bank, the attempts to legitimize settlement outposts established on Palestinian lands in the West Bank and the continued summary executions of Palestinian civilians under the pretext that they pose a security threat to the Israeli forces. PCHR reminds the international community that thousands of Palestinian civilians have been rendered homeless and lived in caravans under tragic circumstances due to the latest Israeli offensive on the Gaza Strip that has been under a tight closure for almost 11 years. PCHR welcomes the UN Security Council’s Resolution No. 2334, which states that settlements are a blatant violation of the Geneva Conventions and calls upon Israel to stop them and not to recognize any demographic change in the oPt since 1967. PCHR hopes this resolution will pave the way for eliminating the settlement crime and bring to justice those responsible for it. PCHR further reiterates that the Gaza Strip and the West Bank, including East Jerusalem, are still under Israeli occupation in spite of Israel’s unilateral disengagement plan of 2005. PCHR emphasizes that there is international recognition of Israel’s obligation to respect international human rights instruments and international humanitarian law. Israel is bound to apply international human rights law and the law of war, sometimes reciprocally and other times in parallel, in a way that achieves the best protection for civilians and remedy for the victims.